By now you all probably know of Prometheus, the tool which allows you to restore to unsigned iOS versions using SHSH2 blobs. If you don’t know what it is, here’s guide to restore to iOS 10.2. 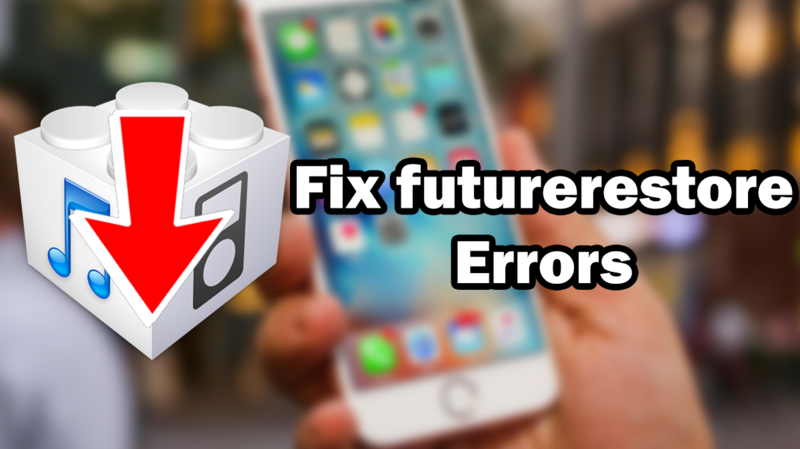 A lot of people have encountered errors while using futurerestore. This article will attempt to help as many people as possible solve their issues. Some of the main issues people have when trying to use futurerestore are caused because their Mac or Linux machine does not have some of the required dependencies installed. This essentially means the software that needs to be installed on your computer before futurerestore can work. This issue is usually caused because software than futurerestore depends on to run is not installed on your computer. Skip step 1 if you are using a Linux machine. If you are asked for a password at any point, just type your mac account password and press the enter key. This should open a pop-up asking you to install the Xcode Command Line Tools. Click the Install button to download and install this. You should hopefully now be able to run futurerestore without any problems. If you have any errors which are not listed here, please comment them below or contact me on Twitter @iPodHacks142 so I can add them. Q: Can I run futurerestore on Windows? A: No, you can’t run futurerestore on windows as there is no Windows version (yet). You can however, create a macOS virtual machine using VirtualBox or VMWare (people seem to have better success with VMWare) and use futurerestore inside of that. Guides for this are easy to find online. Q: When I run nonceEnabler on my device, I get an error like “[!] failed to get the kernel base address”. What does this mean? A: This error usually means that you are using a jailbreak that doesn’t have task_for_pid_0 (tfp0) functionality. This does unfortuanlty mean that you can’t install nonceEnabler on your phone, and can’t use futurerestore with a forced generator. Look at my guide for a list of compatible jailbreaks. Q: I left futurerestore running for hours on my non-jailbroken device and didn’t get any collisions. Did I do something wrong? A: The non-jailbreak method of using futurerestore is pretty unlikely to work, your device would have to randomly generate the exact same nonce as the one in your SHSH2 blob. If you have this running for more than an hour or two, its probably worth giving up. Q: Does Touch ID work after using futurerestore to restore my device? A: This depends on the SEP files of the current signed version by Apple, and the version you are trying to restore to. For example, the sep version for iOS 10.2.1 and 10.2 are the same, therefore Touch ID will work in this case. However, the SEP for iOS 10.2.1 is not fully compatible with iOS 10.1.1, meaning Touch ID would not work if restoring to iOS 10.1.1 with iOS 10.2.1 SEP.
Q: When I try to set a custom generator using nvram on my device, I get an error like “nvram: Error setting variable – ‘com.apple.System.boot-nonce’: (iokit/common) general error”. How do I fix this? A: As far as I can tell, this usually occurs when nonceEnabler has either not been installed on the device, or you got an error when you tried to install nonceEnabler. Make sure to add the nonceEnabler patch to your device, or you will not be able to set custom generators using nvram. This article may be updated from time to time, so keep checking back if your error or question is not listed here. Astonishing post. I would honestly welcome the author to draft more articles about this next online journal post which will bring other crowd to your well established site. And I have done all of the above commands. Firstly, thanks for all these useful writeups. Try put your device in recovery mode. My device is iphone 6 plus IOS 10.2.1. After resolving all the problems, I went to the last step. However, I still can not downgarde on IOS 10.2 because I can not find the appropriate apticket. Help me! I have tried to use future restore on 2 different iMacs, a vm mac and now vm linux. All these systems gave me the exact same code. I am using a iPhone 6 with n61ap, and it is on ios 9.0.2. I set the nonce using cl0ver and nonceEnabler and have even used nvram patcher, setting the nonce is a succes. I have also checked the shsh2 blob and it is valid. But when i run future restore it gives me the same error code over and over again errorcode=-11. Also, i have read almost all the Issues regarding this and the solutions and it still won’t work. Any help ? And here is the result at the end. I have an iPhone5S on 10.2.1. I have valid blobs for 10.2. But there´s no more repeated nonces. So I modified one of my SHSH blobs (almost 2 hours). Now futurerestore matches the device nonce. It does everything until “waiting for device” in restore mode. Error 11. I must say that using tongbu (almost for sure) the 100% collision issue appears on my iPhone. Trying and trying finally (as I expect since the beginning) I was forced to restore 10.2.1 and start again. The 100% issue was gone and of course the nonce used now is not valid. I repeated every step (almost 2 hours again) and I get exactly the same situation. So I have 100% collision, always same nonce from device. But error 11. Please Help Getting This Error , Or Tell Me That no Longer This Method Working. check the command. Don´t do copy/paste. to not write everything, when you select a file (like “-t SomeBlob.SHSH2” you can type “-t S” and then press Tab. i would to ask you what is the version of futurerestore tool you are uesd? After the restore, I noticed that there’s a .dmg file on my Downgrade folder. Is that file somehow useful, should I delete it or keep it? Thanks again. (Also there’s an optional step: check that auto boot is false by running “ nvram -p and hit enter, you should see a bunch of lines, one of which is auto boot is set to false, if so, you’re good to go). In the same terminal again type in “ reboot “ and enter. That instruction is in terminal FROM device, not in your mac. No. Device now should be in recovery. Close iTunes if it launches). 6- Device should already be in recovery mode (the itunes screen with the cable on your device). now run: chmod +x futurerestore_macos (in terminal A, and hit enter then proceed to the next step). Ooops!! True!! I forget that is the jailbroken method… Excuse me… I´m on 10.2.1 (YET?). Hai ..is your problem fix..can u tell me if u work because I got same error with your. Upon below message I decide to leave it for now. This is incorrect. This works all the time, it just depends if iOS versions are compatible. Noted with thanks for your reply.. However may you advise how to fix my error message below. I can restore from iOS 9.3.3 jailbreak to unsigned iOS 10.2 by using correct sep file upon below comment. Thanks for all of your support. “You are using wrong sep file. I got the same error when using mAP with AP model for my 6s+. Hey guys, it says “”waiting for device”” then i got errorcode=-11.. any ideas to solve this error?? Use VirtualBox and create a filter for all USB´s in settings. Set the USB controller to 2 in VirtualBox. and run the futurerestore command without rebooting the phone in the other terminal. Your command looks fine theres nothing wrong with it. And by the way you set the generator before you enter recovery. So SSH into device ( i prefer iPhoneTunnel) then do the whole nonceEnabler thing, then set nvram. Also in VM look for an option to “show all USB devices”. In the same terminal again (terminal A) type in “ reboot “ and enter. No not with virtualbox. I’ve been told to use VMware workstation (pro version only) instead. It has the option to show all usb devices that should (hopefully) prevent connection issue under recovery. I’m setting this up as we speak. Long process but may be worth it. Everything works perfect the only problem I have is when it enters the recovery mode virtualbox does not allow to connect the device but in windows yes, how can I make myself known in virtualbox and not in windows? Anybody fixed the homebrew errors? What i must do with this error please help…i have done all but this have kill hole my day and im not finished with this, till i have some answer from you all about this error and what i can do for good work. Thank you and let me some helpfully answer. Tnx. on this error, isn’t that obvious? So I won’t be able to use this method going from 10.2.1 to 10.2 anymore? I have already entered in all the commands above. I tried it now all over again with the same result. I’m giving up for today, no clue how to resolve this. Then Navigate to the futurerestore directory that you’ve…..you’ve what and what to do into directory or what you mean with futurerestore directory…please explain what we must do verder in that folder? 2. type “cd” and then the directory of your Downgrade folder, if you used to do things like on the tutorial of this Website it’s: “cd /Users/…./Desktop/Downgrade” and “…” stands for your username. You can get it with “whoami”. at which stage you are suggesting to use these commands? i won’t help, I still get this error. That’s just frustrating. I’m also facing the same problem, I’ve installed herbew and other dependencies but still receiving the same error. any clue how to fix it? are you using mac on vmware? or you got a Mac Hardware? i tried four time to use this method, but unfortunately not succes and it take each time a lot of time between 9-10 hours. it’s still request nonce number over and over and over again…. so i will stop trying now, and waiting for new method or upgrade the magnesium of this operation…. My Shsh2 files are valid with both 1conan and img4tool confirmed everything is correct including ROSI tag and device chip model. wBatrakosvSV, what did you make me do? Now I can neither restore iOS 10.2 nor can I kick the iPad out of recovery mode. I strongly advise to stay away from unofficial futurerestore download links that claim to offer windows support. There is no windows version available as there is a problem with some of the programs it depends on which needs to be fixed first. Only download from official links. always this erroronmac > “command not found ” other option? wnat is the decription key in Mega please ? I did all steps and I’m still getting the same issue. I don’t know what to do anymore, googled solutions for hours now…. more than one problem solved…..